Run the seqexpress installation file, this will unpack the distribution and start the installation. If .NET is installed then the main dialog for the installation will now appear, you should select the next button. 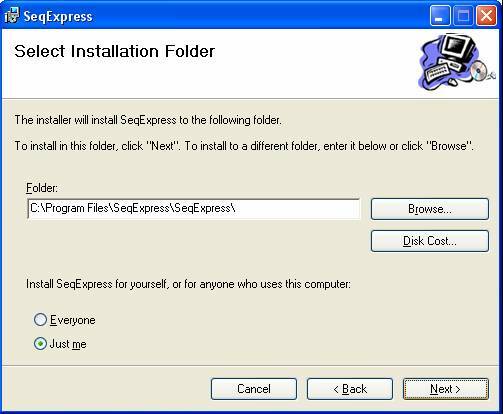 Now decide where you wish to install SeqExpress, and then select next. Another screen will appear, after which SeqExpress will start to install. When it has completed the installation, select the close button. SeqExpress can be started from the desktop icon or via the start menu. More information is available from the help pages. Run the seqexpress server installation file to start the installation The distribution will unpack itself and once complete the installation process will start. First the database will be installed, this is the first of the four tasks. If required the database will be installed on the machine (if you have installed a previous version of SeqExpress this step will be skipped). 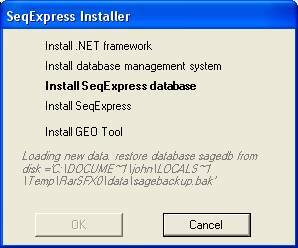 Once the database is install the SeqExpress database will be populated, this will take a few minutes. 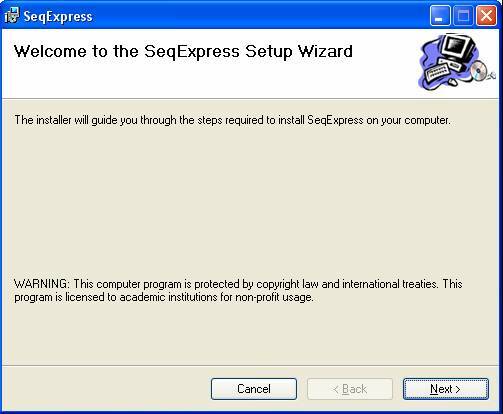 The second stage of the installation is installing the SeqExpress client. The main dialog for the installation will now appear, you should select the next button. Another screen will appear, after which SeqExpress will start to install. When it has completed the installation, select the close button. The GEO Tool will now be installed, this is the final task. Once the task are completed the installation will show the 'install complete' message. 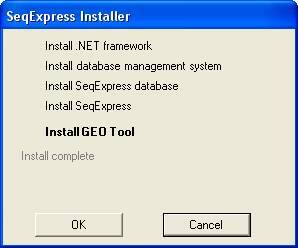 SeqExpress and the GEO Integration Tool can be started from the desktop icon or via the start menu. You should first start the GEO Integration Tool, which will contact GEO and populate the database. More information is available from the help pages.